Last Sunday, we explored the problems surrounding statements of “God’s plan” and how some of these statements can lead to deep questions about God’s presence. Does God plan out each and every second of each and every day? Or did God create the universe and then go on vacation? And where is human responsibility in God’s plan? 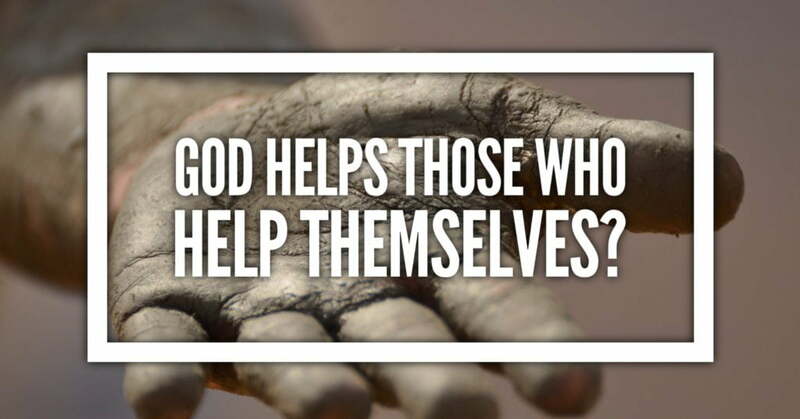 We continue along the thread of human responsibility this week with an exploration of the phrase, “God helps those who help themselves.” Is God’s aid only available to those who jump-start the process? 14But you do see! You do see troublemaking and grief, and you do something about it! The helpless leave it all to you. You are the orphan’s helper. 17Lord, you listen to the desires of those who suffer. You steady their hearts; you listen closely to them, 18to establish justice for the orphan and the oppressed, so that people of the land will never again be terrified. 6In my distress I cried out to the Lord; I called to my God for help. God heard my voice from his temple; I called to him for help, and my call reached his ears. 16From on high God reached down and grabbed me; he took me out of all that water. 1I raise my eyes toward the mountains. Where will my help come from? 2My help comes from the Lord, the maker of heaven and earth. Has anyone said this to you? What were the circumstances? How were you feeling when this was said to you? Have you ever said this to someone else? What were the circumstances? How were you feeling when you said it? What is your experience of God offering care and assistance? Does it only happen when you’ve started to “help yourself,” or does it happen differently? United Methodists affirm the idea of Prevenient Grace. How does this theological idea fit in with the availability of God’s care and assistance? Psalm 68:4-6, Psalm 82:1-4 – In Biblical times, widows and orphans were left without privileged men to care for them. These Psalms (and many others) remind us that God surely lifts up these who were culturally unable to help themselves. Daniel 9:15-19 – With the Israelites in exile in Babylon, Daniel offers a raw confession of the failure of God’s people alongside a bold request for help. Romans 8:5-11 – Paul talks about selfishness and the difficulties of being right with God when we’re overcome with selfishness. But it is God’s Spirit that gives us the strength to break free of selfishness, a gift that we must have because we are helpless without it. Ephesians 2:4-10 – Paul reminds the Ephesians (and us) that God’s grace is a gift, and that living out of our transformation is God’s work – not ours. 1 Corinthians 4:4-7 – Paul writes to a community that has been divided, some claiming superiority over others in their faith. Paul asks, “Who says that you are better than anyone else? What do you have that you didn’t receive?” God helps us far more than we could ever help ourselves. When you think of the phrase, “God helps those who help themselves,” does it affirm the notion of personal responsibility? How? Does it take personal responsibility far enough? Too far? Are there any good things in your life that you are tempted to see as your own doing, something God is fortunate to receive from you? What helps you to remember that, ultimately, you have nothing that you didn’t receive from God? Think about your faith, whatever way you have come to your faith. Did your faith take root ultimately because of something you did? Did your faith take root in spite of you and because of God? Some combination? Are God’s priorities expressed just in occasional activities that come up, or should they be woven into the everyday moments of our lives? Should God’s priorities be a part of our “outside-the-church” lives, like work, vacations, sports, driving, shopping, etc. ?